I'm a big Walter Rhein fan, having read and reviewed his autobiographical Reckless Traveler (highly recommended story of his South American travels), and his fiction Reader of Acheron (also highly recommended, this one being more of dystopian, urban fantasy focused on a culture in which reading is prohibited). Actually, the sequel to The Reader of Acheron is slated for a 2018 release and I was anxious to read more Rhein. So, I grabbed The Bone Sword to tie me over. 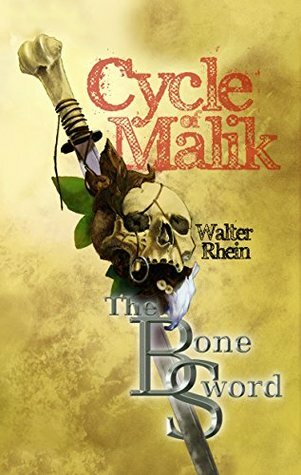 The Bone Sword is classic fantasy with a coming of age story of a brother and sister (Noah and Jasmine). Their savior is the outcast warrior: Malik. This tale is simpler with less philosophical undertones than the Reader or Reckless Traveler. The "bad guys" are undeniably evil (Father Ivory in particular, though one may argue he was 50%crazy). The "good guys" are the young children with brewing, magical potential, and their fellow oppressed villagers. The only "gray" character is Malik, but despite his ability to murder and fight, he is closely aligned with the good guys and brings hope to the battle of Miscony. The first chapter I feared was going to be cliche or overly simplistic, but Rhein quickly introduced meaningful backstory and context. A few chapters in, and I became genuinely attached to the main party. Rhein sprinkles in several very memorable scenes to ramp up the drama. A slight over reliance on rapid healing dampens several stunning sequences that had taken my breath away. The Bone Sword is a step above a lot of fantasy. It is only #1 of a promised cycle, which is great news. For now, I eagerly await "Acheron #2/The Slaves of Erafor #2" which should emerged soon.